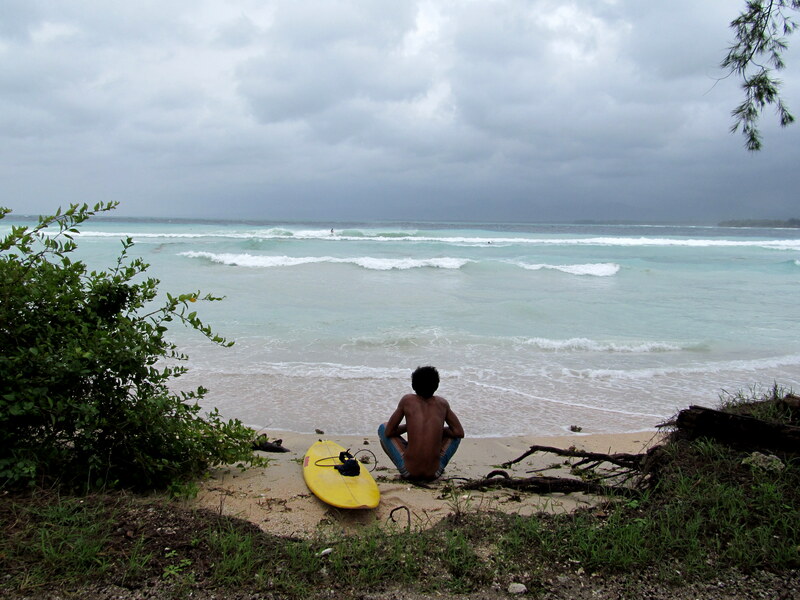 My friend B and I recently hatched a plan to spend a week on one of a trio of islands known colloquially as The Gilis; the three smaller islands just off the western coast of Lombok. We chose Gili Air because of the three, it’s known for its charm, snorkeling – and the total absence of dogs and motor vehicles of any kind. We anticipated our trip with great enthusiasm and only the tiniest bit of research. B and I had visions of Sun, Sand and Sleep. We were on the same wavelength as far as our daily itinerary was concerned: our days would be filled with walking, swimming, snorkeling, eating and reading. Maybe with a little yoga thrown in to encourage some movement in our holidaying muscles. Our adventure began on the fast-boat, the first and only time during the trip that I swore a blue streak under my breath, wondering what on earth I was thinking traveling by boat; gripping onto a bar with dear life while alternating between standing and squatting as the boat rocked, swayed and trembled under the weight of high waves and threatening swells. As if that wasn’t challenging enough: I was simultaneously fending off the sneezing and running nose that I carried with me for two days m ore, resulting from an inexplicable and sudden allergic reaction that began just before boarding the vessel (and using and reusing tissues till they crumbled), and had to keep my bladder under control for nearly 1.5 hours because the toilets were in the cabin below and we’d sought refuge (ha!) on the upper deck. 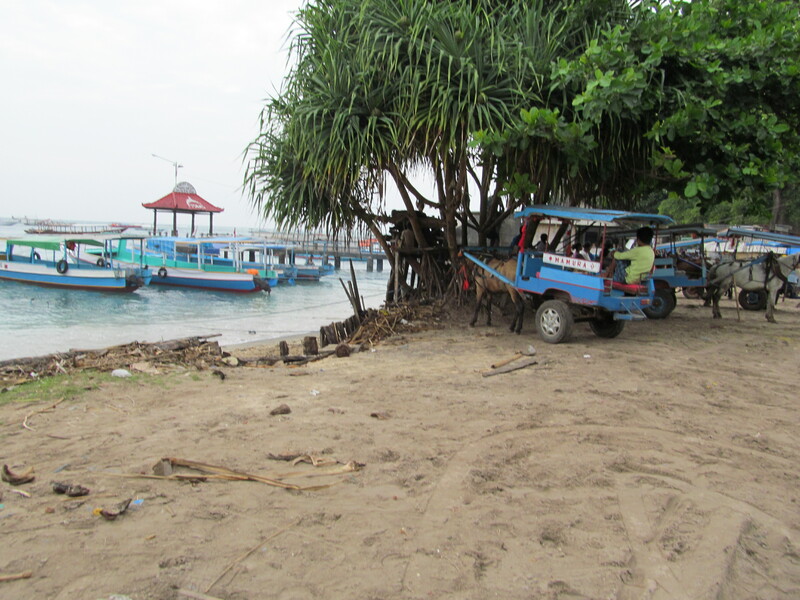 The boat landed with thud on the shores of Gili Air and we dismounted into the shallow waters. 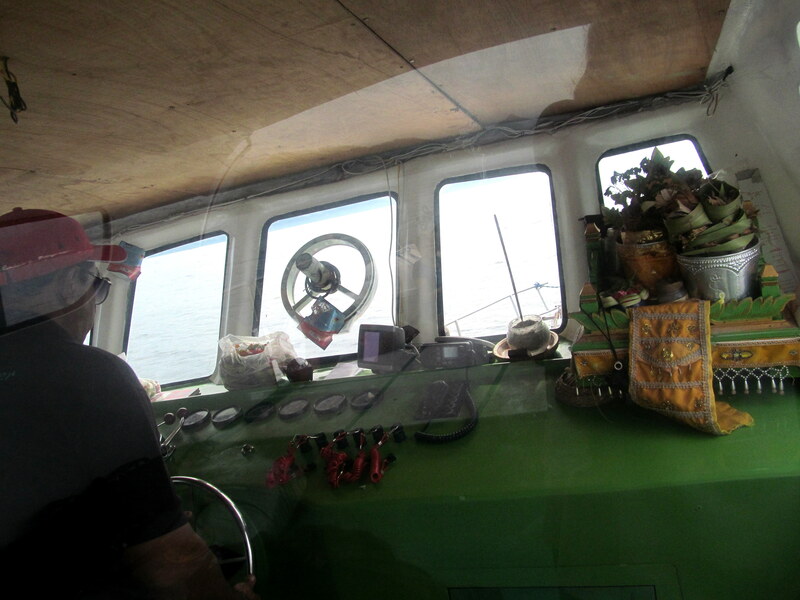 Touts approached us immediately, vying for our attention, eager for us to part with our money once they ferried us around the island to our chosen (or, in our case, not yet chosen) guesthouse. It could have been maddening, but w hen you live and travel in Asia, this circus becomes such a regular occurrence that you barely bat an eye. We finally settled on Arsa, a short man with a well-worn baseball cap, weathered skin and captivating smile. He helped us with our bags and led us to his… horse-cart. Yes, a horse and covered buggy, much like you’d see in a Western, reminiscent also of buggies I saw in the more remote villages of Siberia. In due course, here is what we discovered about this little island way out in the middle of the sea: In Indonesian, Gili Air simply means water island. 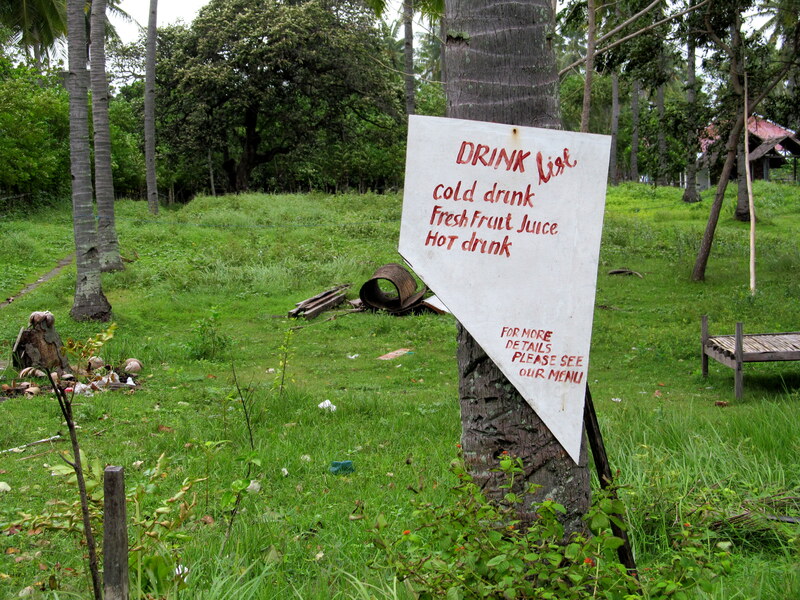 It boasts a vast number of coconut trees and other tree-species that I’ve yet to see anywhere I’ve traveled. The island currently has a year-round population of about 1,500 inhabitants, the majority of whom live in the village in the interior. Most of the locals are either born on the island, arrived from Lombok (a mere 15 minute boat ride away) or are ex-pats running a guesthouse or restaurant. 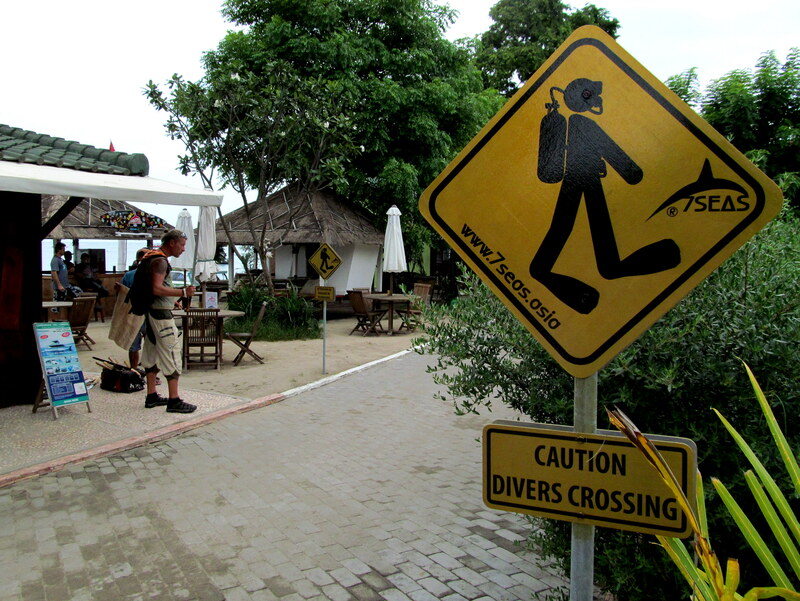 There’s also a group of diehard scuba divers from all parts of the world (primarily of European origin) who work at the diving outfits along the beaches and call Gili Air home. 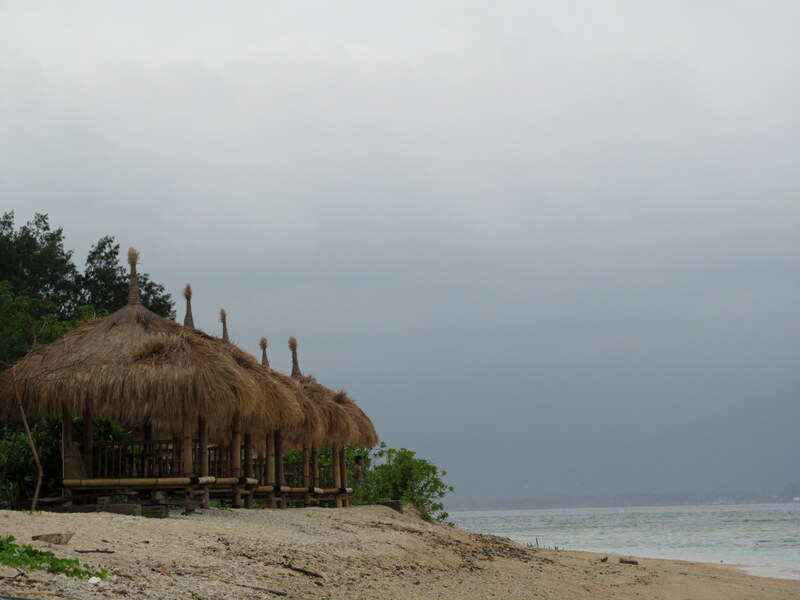 Gili Air’s ‘sister’ islands are the smaller and still-quieter Gili Meno and the larger and rowdier Gili Trawangan. The beaches are piled high primarily with shells and corals that wash up from the reefs surrounding these islands. But this being Asia, many other ubiquitous fragments of detritus appear with depressing regularity – flip-flops and cigarette packages to name but two. Here on Gili Air, it’s not altogether surprising to see the occasional snorkeling mask bobbing in the shallows either. Walking around the island, umbrella in hand, I am struck with the stark emptiness of it. As if we are castaways on a deserted island. Even in parts of the island that typically attract crowds – restaurants, divin g centers, tourist shops, the harbor – the air drips with silence. At times, I’m certain you can hear a pin drop. It’s a place living in limbo, on the edge. A ghost town. 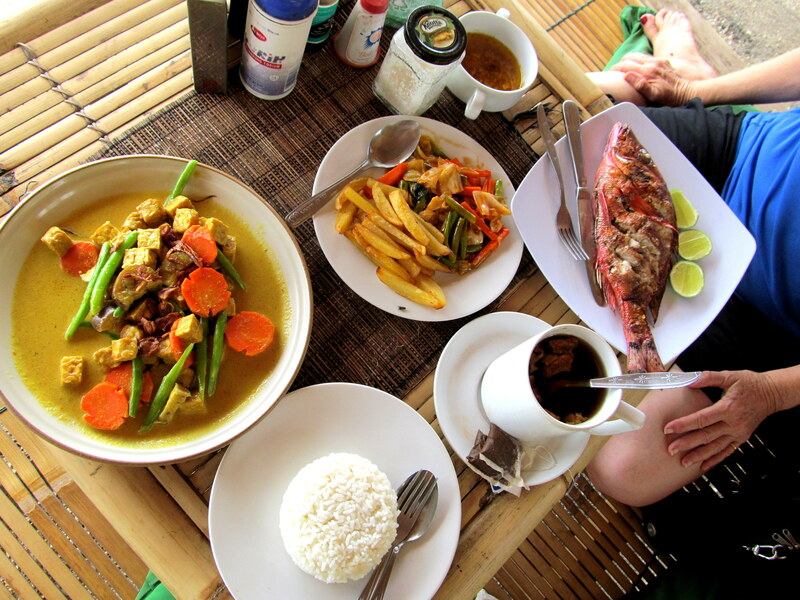 We are Survivors on Gili – but with air conditioning and tastier fare. 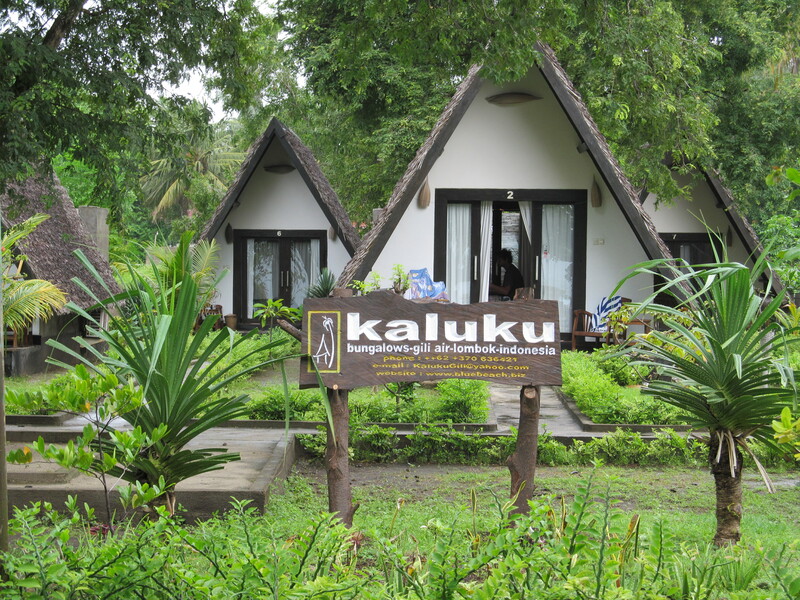 The staff at our guesthouse, Kaluku, is always pleasant and helpful. When the water stops working in our outdoor shower, the young guy assures me that it will start again – just as soon as the water tower fills up again (ah yes, the power outage has played havoc with just about everything). But there is nothing they can do about the glass doors that rattle against the howling wind every night, waking us from sleep, sending B into mild hysteria such that she shoves her suitcase next to one set of the doors and the upright floor-fan against the other. I lie on my back praying that we be spared from tsunamis, earthq uakes and volcanic eruptions. After a couple of days, I decide it’s time to join B on her daily walks around the island. 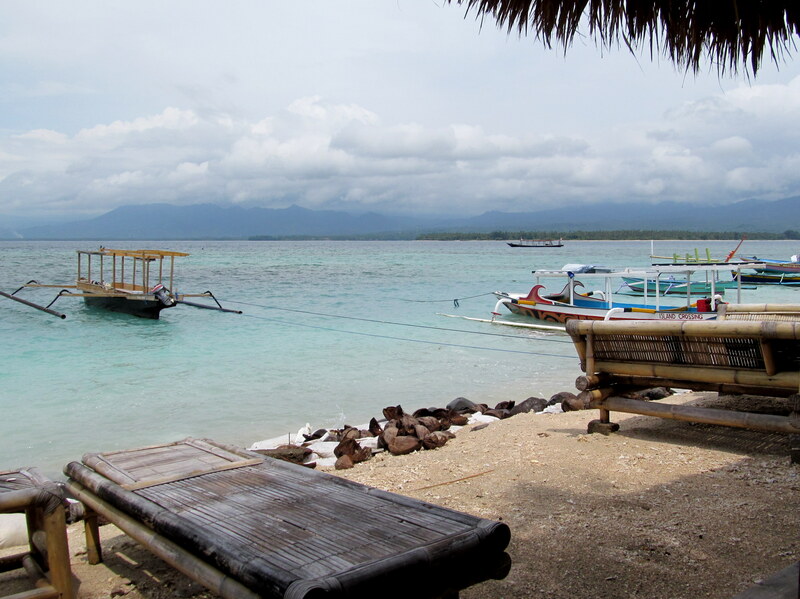 Sounds adventurous, but in fact, the entire periphery of Gili Air can be walked in just over an hour –and even then, you can dilly dally here and there. 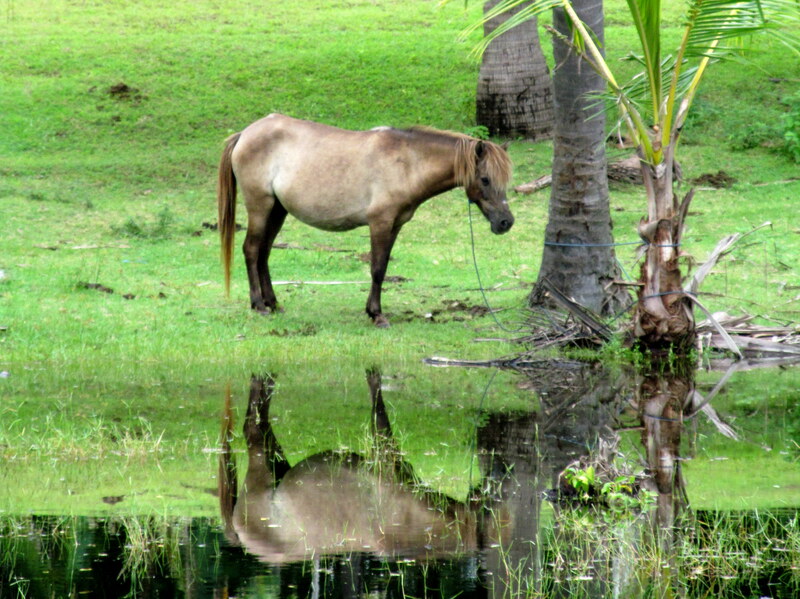 Cows and horses graze in fields, all lush but some also flooded. 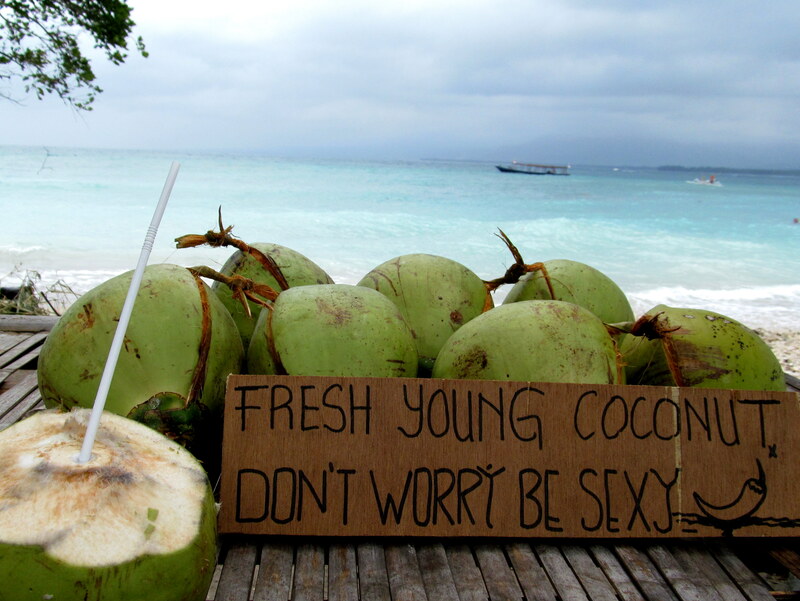 Coconut trees tower above, sway ing in the breeze. Despite the absence of stray dogs on this island, the presence of cats more than makes up for it; they sidle up to us as we eat or meditate with stunning regularity and familiarity. Dilapidated fishing boats are moored high on the shores, some in complete state of disrepair. Abandoned structures. 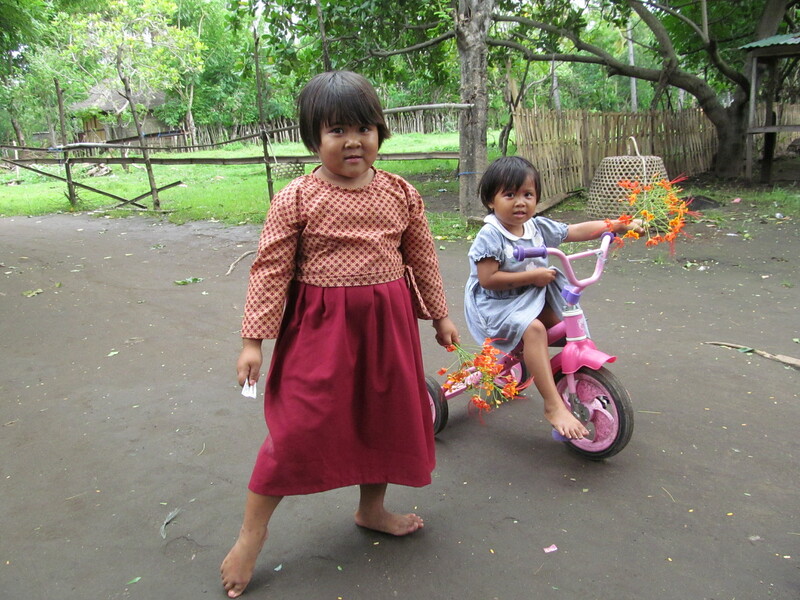 Barefooted children play in the village, using nothing more than objets trouvés. Young local boys a mble by on creaky bicycles, many sizes too small for them. Carts with horses dangling their tell-tale bells approach from behind, prompting me to break out into a jolly tropical rendition of Jingle Bells. After five days of stormy weather and four-foot waves, a s a result of which the fast boats have completely stopped running, there is a palpable scent of despair among the locals. Many shops are closed, some restaurants are boarded up. 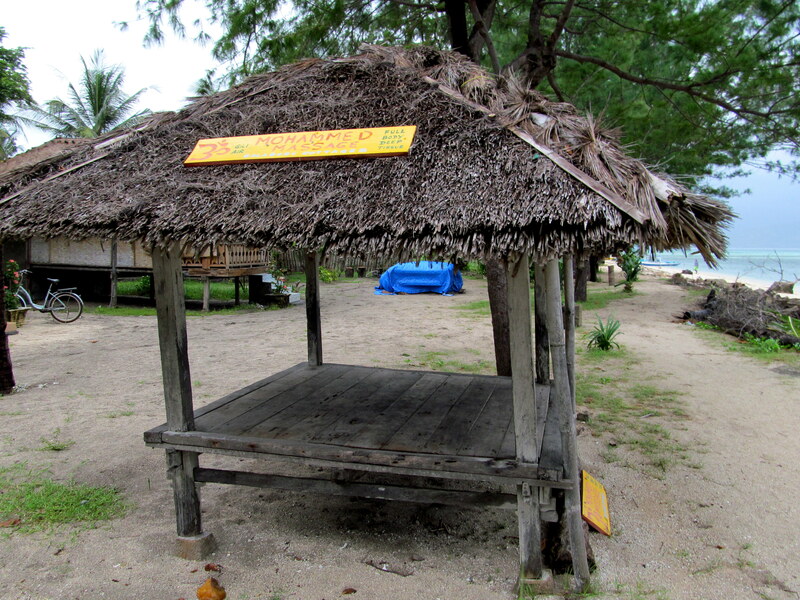 There’s not much for the locals to do when Gili Air empties out. They stand and sweep in a stance that seems more meditative than obligatory. They nap on raised and covered bamboo platforms. 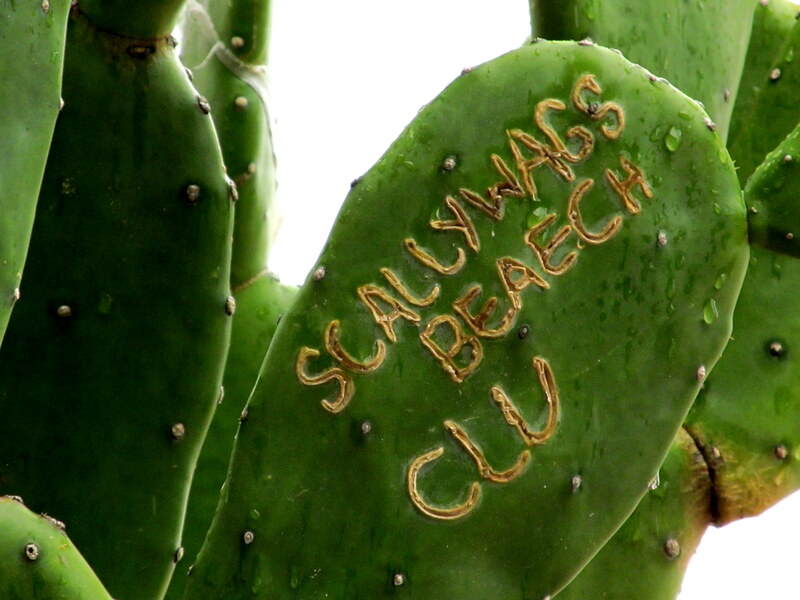 Some repair buildings run down by the salt air, others are in the midst of constructing additions to resorts. There’s a pickup game of soccer down the road. Many sit in the shade playing chess an d video games, or just watching the tourists go by; some call out to us, in tones that are less than convincing, eager for money or just plain conversation. On the other hand, my sense is that our new-found friend Gecko is doing a brisk business, exemplified by the fact that he sells us our daily diet of coco nut – and his improvised stand, next door to our guesthouse, is the only one we’ve seen on the island. 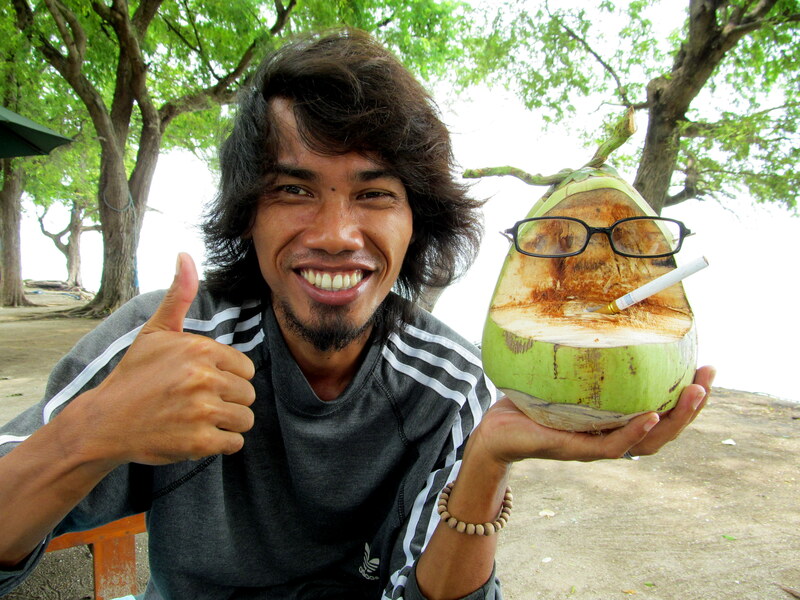 Ipan, flashing a million-rupiah smile, works at the nearby Ali Baba restaurant and feeds us our near-daily ration of fresh fish (yum – snapper!) or vegetable curry. Which means that, unless we want to be penalized hefty fees for using the one and only (and spanking new) ATM machine on the island, we simply must find a way off this island. 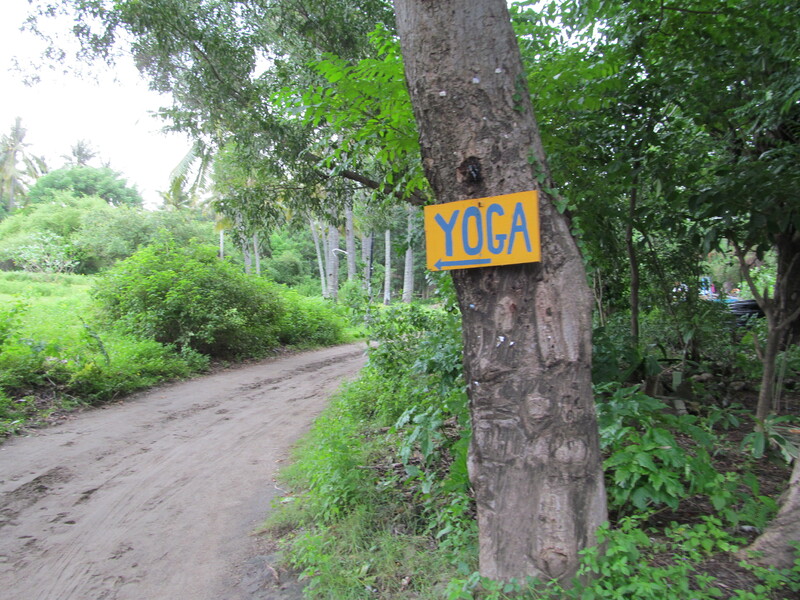 But B has fallen head over heels in love – with the island, with the cats, with the vistas, and with the yoga place. She’s in no mood to leave… It’s a wondrous place, the H2O Yoga and Meditation center. And then, even though we’ve been warned that the fast-boats are not likely to begin to cross again before Tuesday at the earliest, and are both not-so-quietly thrilled at this we-had-no-choice turn of events, we are suddenly informed on Saturday evening that we will in fact be able to depart as scheduled on Sunday morning. Which is how, despite the all-too-treacherous crossing, with waves causing the boat to heave to and fro, sending buckets of water into the lower cabin, triggering mildly-panicked yelps and requests for plastic bags from nauseous passengers (oh no, I want to plead, just please don’t vomit and then heave the bags into the ocean like they do in Laos, Myanmar and Nepal!! ), we ended up leaving the little paradise island yesterday morning that, for a little while was indeed broken – in income only, certainly not in spirit – but will no doubt come alive again very soon. aj, great blog! Just read it to G. in bed! That was fun! 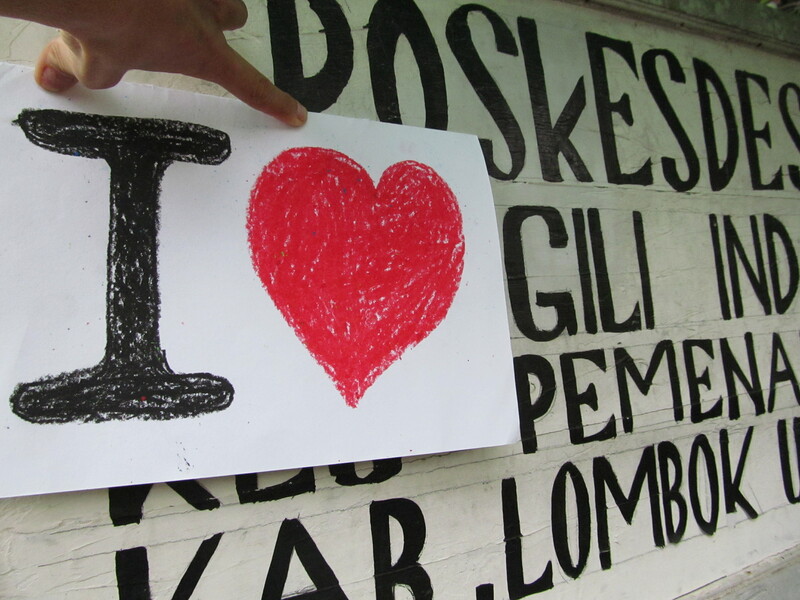 We loved the photos, the LAC vocab and more! G. loved your descriptions of the food,,,yum-my! Glad you came back to ‘mainland’ safely. Uargh! BTW- whats with the Dove advert here??? What a life. We are going to Georgia for Pesach- does not compare to your exotic travels.